Many different kinds of plant foods grew in California like berries. In forest there were foods like pine nuts. The Coast Miwok ate animals like deer and fish. Native Americans found streams full of fish for most of the year. Tule grew by large freshwater lakes. Tule could be eaten as food when the plants were young and tender. Tule was used to make fabric for clothes and for building boats and houses. Tule was probably the most useful plant the California Indians found growing in their territory. Acorns were the main source of food for all tribes. Preparing acorns for a meal was also the women's job. Historians have estimated that one family would eat from fifteen hundred to two thousand pounds of acorn flour a year. Miwok men spent much of their time making fishing and hunting tools. Bows and arrows were built with care to shoot as straight as possible. Size and thickness of bows depended on the size of trees in the tribes territory. Arrows were made depending on their use. Two piece arrows were used in hunting large animals and good for wars. Older men taught boys how to make and repair arrows and weapons. Men spent hours making and mending fishing nets. The string used in making nets often came from the fiber of plants. These fibers were twisted to make them tough and then knotted into nets. Hooks were cut from shells. Sometimes poison was put on top of the water to confuse them and cause them to float to the surface. Not enough poison was used to hurt humans. Trade was an important part of life to the Coast Miwok. They traded fish and shells for hides. The Coast Miwok wanted mined rocks and minerals they made into body paints for religious ceremonies. When they had no items to trade they used strings of shells called dentalium for money. These shells were of great value. They were found in the far Northwest coast. For example, they could buy a house for three strings. That is how valuable they were. The strings of shell were measured by a tattoo on the trader's lower arm or hand. The Coast Miwok traded for stone and made it into tools and arrowheads. Some tribes had craftsmen to make tools made of wood and blades out of obsidian. Stone mortars and pestle, which were used by women for grinding grains into flour, were good trading items. Children and men were naked most of the year because clothing wasn't that important until it got cold. Most women wore a short apron-like skirt. Animal skin blankets were worn by both men and children. They were used like a cape wrapped around the body. All kinds of skins were used. Deer, otter, wildcat, but sea otter fur was thought to be the best. Most California people went barefoot in the villages. I am glad I have warm and comfortable clothes and shoes to wear. Miwok women made be beautiful baskets. They may have been the finest basket makers in the world. Baskets were used for storing food , carrying babies and even for hauling water. In floods sometimes children, women and belongings crossed flooded rivers and lakes in baskets because they were sewn so tightly. Baskets also made good cooking pots. Very hot rock were taken from a fire and rolled inside the basket with a tree branch until the food in the basket was cooked. Most baskets were made for a reason but some were made for the beauty alone. They were also good for trading for needed goods. Older women in the tribe would teach the young girls to weave baskets. Not many California tribes used pottery. Not many tribes liked pottery. For example, pottery of California tribes were always a dull red color. Designs were scarce and always in yellow. Religion Tribal members had strong beliefs in the power of spirits or gods around them. Each tribe was different, but all felt the importance of never making a spirit angry. Usually spritual powers were thought to belong to birds or animals. Most tribes people felt bears were very wicked and should not be eaten. The Coast Miwok lived in the coast so their god was maybe sun. Some people feared their gods power. If they did something horrible, it was thought that person would get bad luck. BIBLIOGRAPHY Emanuels, George. California Indians : an illustrated guide. Walnut Creek, California. Diablo Books. Pgs 71-81. Time-Life. The Indians of California. Editors of Time-Life Books. Alexandra, Virginia. Pgs 50-51 & 53-54. Boule, Mary Null. 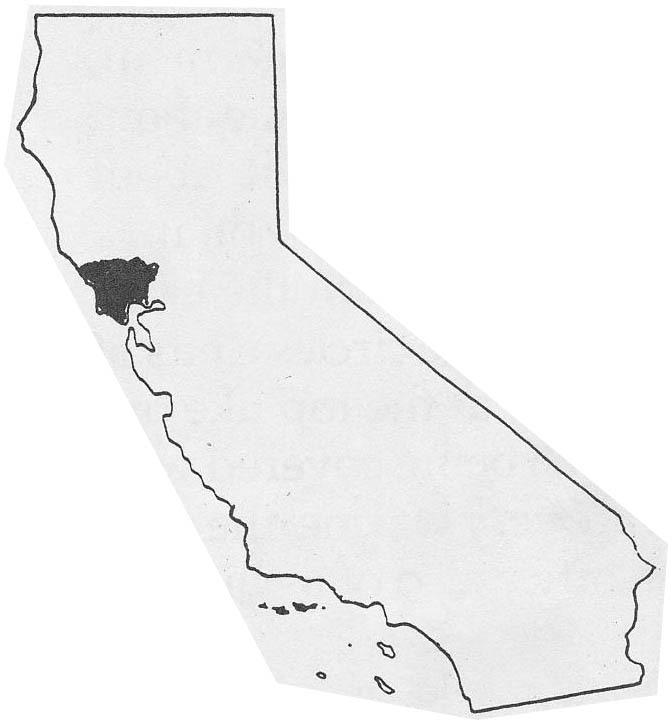 California Native America Tribes : Coast Miwok Tribe. Merryant Publishing, Vashon, Washington. Pgs 6-29.